uTorrent Web is a web-based client of the still-popular uTorrent BitTorrent application. The developers of uTorrent announced plans to release a web-based version of uTorrent in early 2017. Note: uTorrent Web is blocked by Windows Defender and possibly also other security software as potentially unwanted software. You may need to exclude the program or move it out of quarantine to download and use it. The uTorrent Web client is available for Windows right now. It runs in the background on the Windows machine and starts a locally hosted server that you interact with using your browser of choice. The app loads a basic interface on start that you may use to run searches on Google. You may want to click on the x-icon to close it to display the full interface. From there it is possible to add magent links or torrent files using drag & drop, and download the files to the system right away. 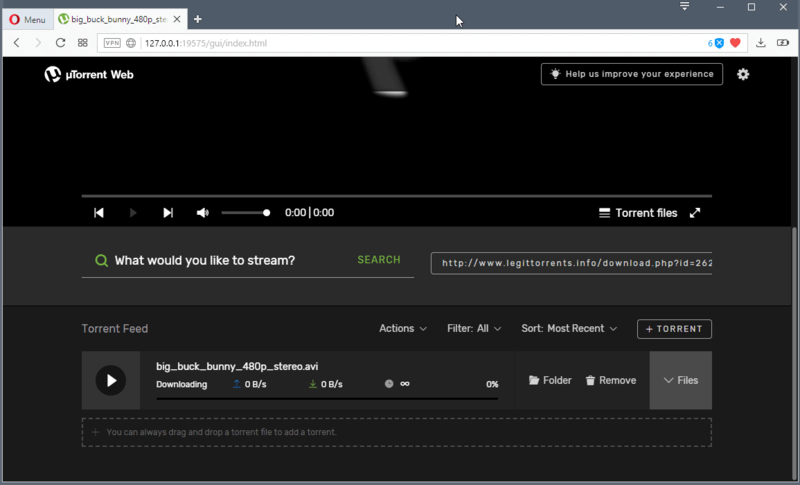 You may stream video content right away; uTorrent Web comes with a media player that you may use for that purpose. What that means is that you can use the service to watch the video while it is downloaded to the local system. This is not a unique feature but some users may like it nevertheless. It is a good idea to check the options before you start to add torrent files or magnet links to uTorrent Web. The settings list options to change the default download directory, auto-start options, and upload and download speed limits. The settings are fairly limited when you compare what is available to uTorrent's settings or the settings of other BitTorrent clients such as qBitTorrent. Out of the top of my head, important settings that uTorrent Web lacks include blocking IP addresses, changing ports, configuring proxies, checking peers and seeders, schedule bandwidth or ratio per torrent, or tracker management. uTorrent Web is a work in progress. It is clearly labeled as beta and it would be unfair to judge it by comparing it to established BitTorrent clients. The client is easy to use and does not require any knowledge of ports or other advanced topics that come along with many BitTorrent setups. While that is certainly good, its lack of options is concerning as it gives users little control over the whole operation. Besides that, I cannot really think of many scenarios where I'd prefer to use a web-based client over a desktop software. Several security issues were discovered by Google Project Zero wizard Travis Ormandy who discovered that attackers may abuse the issues to download malware to user computers, change download folder locations, or obtain the RPC server's "authentication secret" to gain complete control over the uTorrent Web Client. The most recent versions of uTorrent Web and uTorrent are patched. Now You: Which torrent client do you use, if any? I’m using uTorrent 3.2.3 and with “webui.allow_pairing” set to false in the Advanced settings the vulnerability demo page available on Bleeping Computer does nothing. I’ve never used the Web UI or Remote Access anyway so it won’t be missed. From what I’ve read the uTorrent desktop client is vulnerable starting with version 3.0 (using default config) and older versions (like v2.2.1) are not affected by the exploits. I’m using v3.2.3 with “webui.allow_pairing” set to false and I’ve also set “webui.token_auth” to false. And with the proxy exploit I was unable to get it to work using either Firefox or Chrome. Over on Ars Technica there is an article that shows an exploit test page for the web client and two test pages for the desktop client. A few years ago I went from v2.2.1 to v3.2.3 because the proxy I use started to have slower download speeds on v2.2.1 for whatever weird reason. I’m currently using 14 advanced settings along with many other changes including disk read/write cache, not even close to a default config. I’m so used to the uTorrent UI now it would be very difficult for me to transition to something else. I still use uTorrent v 2.2.1. Call it insecure if you will but it caches and downloads from magnet and torrent links reliably, whereas newer releases tend to be more prone to timeouts. I just checked the latest version’s size, it’s >2MB while mine is around 200kb. They should change the name to bTorrent(bloated torrent). As much as I love tixati I left it because its impossible to fully proxy every packet..it leaks like a fishing net. I don’t want to use 3’rd party software to proxy the torrent client. Deluge also leaks a few packets even if you have the right settings. qBittorrent with the right configuration can be successfully proxied to a remote server for anon operation now that any torrent can be a honeypot. Started to use a qBittorrent year ago and still in love this it. Similar interface to uTorrent, online search, locating\relocating torrents by category and RSS downloader with rules without problems. started using deluge on windows clients approx 2 yrs ago after the whole security fiasco with utorrent hit. honestly I liked the utorrent setup and stuff, just the bundled crap and ads inserted were over the line. qBittorent. Safe, stable, open source, fully featured. To do what, what is it for in general? To download stuff. Checking my download list, I last downloaded a total conversion for Skyrim, and a documentary about farm animals. In the past, I’ve used it to share big files with colleagues but I use another easier to use software now (I’m talking big files, not stuff you can put on dropbox). Yeah not really looking to switch from desktop software to some web whatever. Enjoy your ads. I rarely download torrents and when I do, I use FDM. The aforementioned bug will finally kill this terrible client, finally.